In 1898, with victory in the Spanish-American War and the official annexation of Hawaii, the United States suddenly found in its possession a significant overseas empire stretching from the Caribbean, across the Pacific to the South China Sea. The acquisition of these territories was a process of many years, and intervention in the Cuban War of Independence, as well as the annexation of Hawaii, was debated in the press and by politicians in the preceding decades. As Americans came to terms with their new colonial possessions and came face-to-face with often hostile colonial subjects, imperialist and racist sentiments were expressed through cultural outlets ranging from so-called ‘dime novels’ and satirical cartoons to grand, popular exhibitions like the St Louis World’s Fair. The significance of the racialised images presented through these cultural outlets has been much explored by American historians. Images of Filipinos, Haitians, Cubans, and other colonial subjects, as well as other foreign races, such as Chinese and Eastern European immigrants or the African subjects of European empires, served to reinforce the concept of white male dominance and racial exceptionalism which were expressed through government policy and social Darwinism. 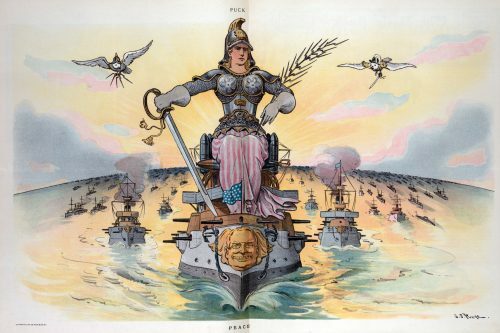 Historians now have a firm understanding of the ways in which a ‘culture of imperialism’, as Mary Renda has dubbed it, arose in the United States in the late nineteenth and early twentieth centuries. While American imperial culture has been much discussed for what it reveals about white, ‘Anglo-Saxon’ and establishment perceptions of foreigners,the general popularity of imperialism in the United States – that is, the general public’s enthusiasm for empire and the prevalence of imperialist themes in popular culture – has however not been debated as it has within British historiography. The debate over the notion of ‘popular imperialism’ has formed an essential part of scholarship on British imperial culture in the past three decades. By studying the ways in which working-class and lower middle-class Britons were exposed to empire and imperialist sentiments through popular culture, John M. MacKenzie, from the 1980s onwards, has pioneered and directed a new approach to imperial cultural history, which rejected the previously dominant notion within scholarship that the working classes were indifferent to imperialism. His 1984 publication Propaganda and Empire inaugurated a discourse which has been developed further through his prolific ‘Studies in Imperialism’ series, in which various contributors have explored the ways in which empire was promoted to the British public through theatre, music-hall songs, royal pageantry, exhibitions, militarism, popular literature and schooling – indeed, most facets of Victorian and Edwardian popular culture. This culture in turn instilled enthusiasm for empire amongst the working classes, who demonstrated support for the empire through their own cultural creations – patriotic songs, for instance – and pro-war demonstrations, emboldening imperialists within establishment politics. Importantly, the notion of popular imperialism is a debated issue. Whether British imperialism was ‘popular’ or not has been contested ever since MacKenzie first established the concept. Bernard Porter is perhaps the most notable critic of the concept and argues that, while the working-classes were certainly involved in imperialist culture, this does not guarantee that the majority of the public was enthusiastic for empire. Working-class members of society would have been much more concerned with the more immediate political and social issues such as working hours and labour laws, even expressing anti-imperialist sentiments through trade union activity and their support for the nascent Labour Party. Porter thus questions the degree to which the British Empire was popular. In his view, ‘popular imperialists’, like MacKenzie and his school, have been overly keen in illustrating the extent and effectiveness of imperial culture, especially since popular culture such as literature expressed many other, non-imperial themes. Furthermore, he argues that the popular enthusiasm for overseas wars – for example the enthusiasm expressed in songs and public demonstrations during the Boer War – is reflective less of explicit support for the general project of overseas imperial conquest, and more of patriotic sentiments among the working classes. The popular imperialism debate in British scholarship has thus demonstrated the importance of studying working-class involvement in empire, as a means of understanding the significance of imperial culture: debating working-class responses to imperialist themes means historians can begin to assess the effectiveness of imperial culture in manipulating public attitudes. Due to the lack of any similar debate in American scholarship, working-class involvement in American imperial culture remains relatively underexplored. American imperial culture bears many of the hallmarks of popular imperialism in Britain. Highly popular grand exhibitions throughout the nineteenth and early twentieth centuries conveyed concepts of white racial supremacy. At the 1893 Columbian Exposition and the 1898 Trans-Mississippi and International Exposition, imperial subjects such as Native Americans, Africans and Filipinos were displayed in ethnographical ‘villages’, juxtaposed with vast neoclassical halls containing modern machinery and the trappings of white civilization. Cheap popular fiction consistently replayed themes of young, white American men in colonial settings, such as the Philippines, Cuba, and the western American frontier, to a mass-consumer market. Moreover, satirical cartoons and the popular press transmitted to their readers the realities of America’s newfound imperial possessions. Cartoons frequently presented figures like Uncle Sam and Theodore Roosevelt in a position of tutelage over childlike colonial subjects, or striding across the globe and directing overseas projects in the colonial territories and Panama. In fact, the popular press had played a central role in agitating support for overseas conquest before 1898 by promoting intervention in the Cuban War of Independence. Hence, imperial anxieties and sentiments were expressed through popular culture, in the period that similar anxieties about race and genetics crystallised into Social Darwinism. Yet, as Bernard Porter notes, historians of American imperialism have not yet studied such evidence for what it reveals about popular imperialism in America. American historians like Amy Kaplan instead have focused heavily on what cultural evidence reveals about white, middle- and upper-class imperial anxieties concerning race and gender – hence the ostentatious presentations of white civilisation at exhibitions, or the depiction of heroic white colonialists in popular literature. Historians’ understanding of imperial culture in America is limited as a result, since there has been no debate over how far the general public were integrated into the cultural world of imperialism and how far they were enthused by it. That colonialism and imperialist sentiments, especially masculine, Anglo-Saxon ones, were expressed through popular cultural outlets is clear; but simply analysing this culture for the elite anxieties it reveals neglects to assess how successful such culture may have been in galvanising widespread support. Historians need to begin to question whether Americans in general were imperialist, how far they might have been aware of empire, and how significant imperialist culture was in the broader context of popular culture – which relied upon many other, non-imperialist themes from theatrical blackface to factory fictions. Understanding popular imperialism in America is all the more significant because the American empire is an extant empire. The United States continues to exert unrivalled influence abroad, a role which undoubtedly has a pronounced effect on American culture. Indeed, cultural historians of late nineteenth-century United States imperialism, like Amy Kaplan and Matthew Jacobson, have found clear precedents for contemporary imperialist political sentiments. However, historians’ understanding of such precedents is clearly limited – it is not clear whether popular politics at the time was imperialist. Questioning how far the early empire was popular might reveal discrepancies between the past and present, or even reaffirm similarities. Either way, a more comprehensive look at imperial culture is needed if historians are to gain a fuller understanding of the origins of American jingoism and popular patriotism, and the motivations behind overseas conquest – an understanding which recognises that imperialism extends beyond establishment and elite concerns. Matthew Frye Jacobson, Barbarian Virtues: The United States Encounters Foreign Peoples at Home and Abroad, 1876-1917 (New York, 2000), pp. 6-7, 258-259. Mary Renda, Taking Haiti: Military Occupation & the Culture of U.S. Imperialism, 1915-1940 (Chapel Hill, North Carolina, 2001), pp. 13, 61-64, 301. Bernard Porter, ‘Popular Imperialism: Broadening the Context’, The Journal of Imperial and Commonwealth History, 39, 5 (2011), p. 833; John M. MacKenzie, Propaganda and Empire: The Manipulation of British Public Opinion, 1880-1960 (Manchester, 1984), pp. 3-4. MacKenzie, Propaganda and Empire, pp. 3-4; ‘studies in imperialism’ series (need proper reference); Porter, ‘Broadening the Context’, pp. 833-834. Porter, ‘Broadening the Context’, pp. 833-834. Bernard Porter, The Absent-Minded Imperialists: Empire, Society, and Culture in Britain (Oxford, 2008), pp. 6-8, 13. Robert Rydell, All the World’s a Fair: Visions of Empire at American International Expositions, 1876-1916 (Chicago, 1987), pp. 38-43. Brian Rouleau, ‘Childhood’s Imperial Imagination: Edward Stratemeyer’s Fiction Factory and the Valorization of American Empire’, The Journal of the Gilded Age and the Progressive Era, 7, 4 (2008), pp. 480-482. Jacobson, Barbarian Virtues, pp. 6-7. Louis A. Pérez Jr., Cuba in the American Imagination: Metaphor and Imperial Ethos (Chapel Hill, North Carolina, 2008), pp. 10-18. Jacobson, Barbarian Virtues, pp. 7-10, 250-253. Amy Kaplan, The Anarchy of Empire in the Making of U.S. Culture (Cambridge, Massachusetts, 2002), pp. 1-3. Ibid., pp. 1-3, 234-238; Jacobson, Barbarian Virtues, pp.